Do you know I’ve never seen either? I’m sorry this was a bit of a disappointment for you, but I’m not overly surprised. Thanks for the great review, though! Well, I’d definately recommend the book if you haven’t already red it. I’m trying to decide whether or not to bother recommending De Palma’s version. A few of our blogger friends named it as one of their three Mother-Daughter movies so that’s probably reason enough to check it out. Spacek and Laurie really are great too. Good review, but I didn’t mind it all that much. Most likely because I wasn’t expecting anything better than the original. I have to admit, the transition from top of the world as prom queen to being humiliated and covered in pig’s blood gets me every time, regardless of which version I’m watching. Did you know that I have been prom queen, AND covered in pig’s blood, but never on the same night. I’d imagine it’s pretty traumatic being covered in pig’s blood but I’m glad your prom dress was spared at least. Nice review. This one is a decent remake but for me it didn’t really add enough to justify itself. King’s book are so tough to adapt though! Thanks for checking out my review. 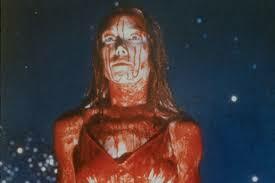 I think the 1976 Carrie, for all its faults, is my favourite King adaptation. You’re right, it’s not easy and even the combined efforts of Stanley Kubrick and Jack Nicholson couldn’t get it quite right. An article just popped up on my Facebook feed, I think it was Dread Central that talked about an uncut version of the film that was much more violent and far more true to the book. Seems there is a petition to get the uncut version released, which was only shown during pre-screenings. Hopefully it happens. I’d sign that, I’ll have to look that up. Thanks! I think the themes of the original are timeless and therefore don’t find it as dated as you except in the wardrobe department. A lot of the dialogueis you refer to as hokey feels like it’s done that way on purpose. I’m basing this on the idea that it’s far more satire than horror. However, i was cool with the remake. They just didn’t do the material justice. I don’t think it was terrible, just entirely forgettable. That’s a shame because it is a movie that should have been much better. Rather than go into a long, detailed explanation on what I think it did wrong, I’ll just link my reviews of each.